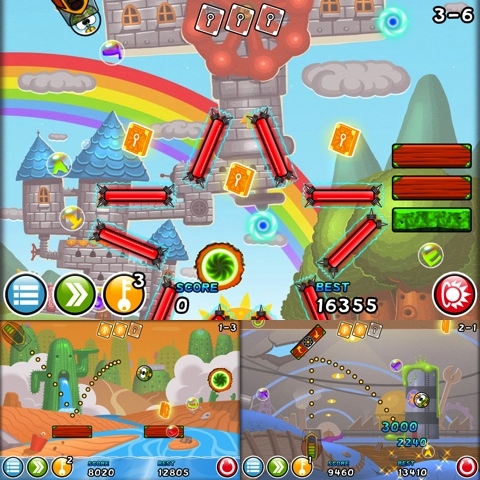 Let Me Out by Chillingo is an iPhone puzzle game similar in many ways to Cut the Rope. Let Me Out is a $0.99 universal iPhone app that requires iOS 3.1 or later, and it works on the iPad and iPod touch as well. For the purposes of this review, we played the application on an iPhone 4S. The central character of Let Me Out is a book dragon — think bookworm on steroids. This book dragon is on a mission to collect golden pages, apparently the scattered pages of some great manuscript. In order to do so, however, it’s going to have to cross a wide array of increasingly difficult levels. The book dragon crosses these levels by bouncing. On the earliest stages, it’ll cross on a single bounce, but as the game progresses, it requires several or more. The book dragon can bounce off the sides of the screen as well as wooden blocks, which the player can position. The player can also choose the angle and force at which the book dragon is injected from its cannon — don’t overthink this. So the goal each level is to set the board up in such a way that it lets the book dragon safely cross once you’ve fired it from the cannon. Upon firing, it’s all hands off, so this is much more a puzzle experience than it is a platformer. Each level has three pages to collect, and as Let Me Out progresses, it places those pages in much more complex arrangements. For us, some of the higher levels required a lot of thought before we even sniffed how to approach it. Let Me Out comes with five environments: Desert, Factory, Castle, Toyland and Iceberg. There’s also a level stub that reads, “New levels coming soon!” Apparently, they’ll be free additions to the come. Each of these levels has 20 sublevels. The first level, Desert, has 60 items to collect, but depending on the level, that ranges from 40, on Factory, to 220, on Iceberg. Some levels also have floating letters. Collecting these letters is optional, and you can complete the board without them. However, completing the alphabet is Let Me Out’s achievement system, and the application does have GameCenter integration. The letters also up the challenge immensely, so we imagine that most gamers who favor these types of games will not want to leave them behind. The bottom line of this review is that Let Me Out is a very good iOS puzzle experience. It’s certainly worth $0.99, and it’ll be even more worth it once those additional levels come. The cartoonish graphics are excellent. The music and sound effects are professional and diverse. And the app provides a lot of replay value. Let Me Out works quite well on the iPhone and iPod touch, but it would of course benefit from the additional screen area that the iPad provides. AppSafari review of Let Me Out was written by Darius Reimm on March 13th, 2012 and categorized under App Store, Games, iPad apps, Puzzler, Universal. Page viewed 3743 times, 1 so far today. Need help on using these apps? Please read the Help Page.